Q1) What do Wolf Parade, Arcade Fire, and Junior Boys all have in common? A: Initial hype in overdrive fuelled onwards by dozens of bloggers writing about "emotional live shows," "BEST BAND EVER!" and so forth. 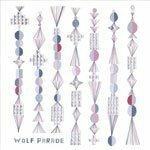 Q2) In these blogs, Wolf Parade is most often compared to _________. E) I would have used real examples from other sources, but could have been sued. These are all about as valid anyways. If there was ever one problem with blog-derived hype, it's that it causes an unstoppable flurry of horrible X + Y comparisons that bloat in ridiculousness as a thousand writers try to out-do one another. Perhaps in trying to qualify an album based solely on all its similarities with other albums we worshiped in the past, we only succeed in making it seem less relevant today. This is especially the case with a band such as Wolf Parade or Arcade Fire, which break no new ground themselves, but live next door to some of our other favourite albums. Why do we always hurt the ones we love? It will be relatively impossible to continue, though, without any comparisons, so I will limit myself to mentioning only one band per sentence. Wolf Parade is a great band, and while one will automatically think of Brock when they first hear You Are a Runner I Am My Father's Son, (or any song featuring the first of the band's two vocalists, Spencer Krug,) many of the album's strongest moments actually come when they more closely resemble other bands. Same Ghost Every Night and Dear Sons and Daughters of Hungry Ghosts actually sound more like stretched-out Frog Eye styled songs. This makes sense as, vocals aside, the band's choice of instrumentation, simple drums, keyboard and the other usuals, more resembles the latter. The longer songs all have an epic quality and maintain lyrical significance, bizarrely enough, even when the words are unintelligible. Also strange - when the songs are shorter, they still manage to retain this epic quality. After listening to a song like the closer This Hearts On Fire, one would swear that over four minutes had elapsed. The album's epic quality continues into the semi-coherent themes that are always present in the lyrics; a common trait of many great albums, which I won't mention for fear of being a hypocrite. We are cryptically told of frustrations with technology, one of the most obvious themes, such as buses that "scrape their brakes all over town." Wolf Parade uses an escapist approach to distance themselves from all this, and they long for a more natural place where "nobody knows you/ And nobody gives a damn either way," complete with whales, trees, and sunshine. With such disdain for technology, one has to wonder how the band reacted to the massive blog hype: whether they embraced it, or turned away from their computers. With lyrics like "Sometimes We Rock and Roll/I'd Rather Stay at Home and Feel Alive," and songs like We Built Another World, I think we can all figure out the answer to that one.